It's probably safe to assume that most Americans are familiar with Neil Armstrong and his legendary, history-making walk on the moon in 1969. "That's one small step for man, one giant leap for mankind" has entered the cultural lexicon like few other phrases before or since. What's not as well known is how Armstrong came to that moment, becoming the first man to walk on the moon after overcoming great personal and professional adversity. First Man is that story. Fresh off the success of La La Land (for which he won an Academy Award for Best Director), Damien Chazelle chose a remarkably ambitious project for his follow-up film, his first not centered on jazz music. Reuniting with his La La Land star, Ryan Gosling, as Armstrong, Chazelle takes an uncommonly personal look into the life of an American hero. Gosling plays Armstrong with a kind of understated grace, a man not seeking glory or attention but in some ways an escape from the grief over losing a child. 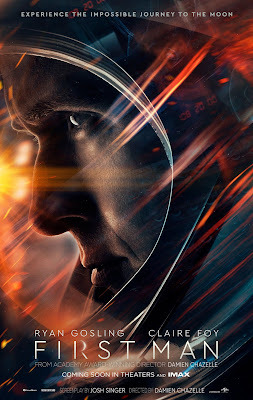 Chazelle traces Armstrong's journey to the moon from the earliest training missions all the way to his iconic moonwalk, immersing us not only in the world of NASA in the 1960s, but in Armstrong's relationship with his wife, Janet (Claire Foy), who is much more than just a character who holds down the home front and looks concerned. As accidents claim the lives of fellow astronauts, the Armstrongs struggle to come to terms with the thought that Neil might not survive his Icarus-like quest. For all the film's majesty and wonder, these scenes are what really make the film so special. Screenwriter Josh Singer (Spotlight, The Post) gives the film a backbone grounded in real human emotion, while Chazelle frames all the space scenes from Armstrong's point of view. As a result, First Man is an often dirty, extremely tactile film, eschewing the clean brightness so often associated with movies about space and replacing it with a grungy sense of lived-in realism. Cinematographer Linus Sandgren's grainy camerawork, with its verité-style handheld aesthetic, keeps the action focused on the interiors, favoring close-up shots within the spacecraft cockpits over sweeping shots of celestial grandiosity, its inky shadows and rich blue textures resembling contemporary films from the 1960s. The result is a wholly immersive cinematic experience, using stellar sound design and a beautifully understated score by Oscar-winning composer Justin Hurwitz to envelop the audience in the Gemini and Apollo missions. By resisting the urge to overemphasize the scale of NASA's, and by extension Armstrong's, achievements, Chazelle and his crew have crafted a film that is both grounded and deeply engaging. It's an incredible achievement on a technical level, but even more impressive is its focus on the emotional backbone that made it all possible. First Man never loses sight of the human cost of exploration and national achievement, wondering aloud if the destination is ultimately worth its staggering toll. What was it all for? Exploration for the sake of exploration? A symbolic victory against an enemy? Human folly? Or was it about something much more, something perhaps more profound than anyone ever imagined? Chazelle takes an epic tale and brings it down to earth, making the monumental personal and the historic immediate. Rarely are films of this scale so deeply intimate and yet so grandly realized. First Man inspires awe not just through the scope of its story but because of its depth of feeling. It's a visceral, mesmerizing experience that does great justice to the event, and to the man, that inspired it. 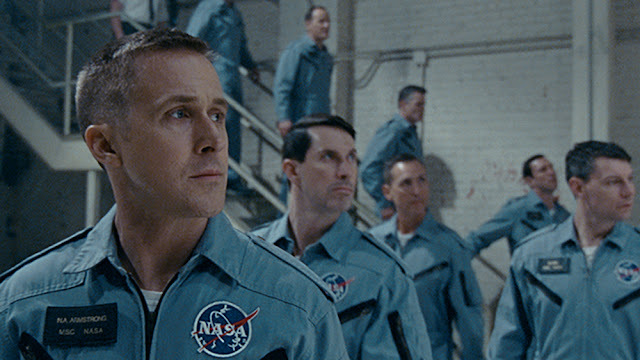 FIRST MAN | Directed by Damien Chazelle | Stars Ryan Gosling, Claire Foy, Corey Stoll, Kyle Chandler, Jason Clarke, Shea Whigham, Christopher Abbott, Brian d'Arcy James, Pablo Schreiber, Patrick Fugit | Rated PG-13 for some thematic content involving peril, and brief strong language | Opens Friday, 10/12, in theaters nationwide.